Lillian's Loft | Exploring barriers between reality and other realities… Is it fantasy or just a step through a dimension portal? Here we are at the end of March. The month came in like a lion and today is lamb-like calm and sunny for the most part. The past few days are suggesting that spring has finally arrived in my part of the world (Reno, Nevada) but I know as soon as my pear tree blooms another freezing, windy storm will be along. Never fails. But I am here to let you know that I am doing another book giveaway! I am thrilled to have one of my novels, Funeral Singer: A Song for Marielle, be part of a month-long giveaway for paranormal and urban fantasy starter books in a series. This begins tomorrow, April 1st, and runs until April 30th. That means you have the whole month to check out the link (click on the picture above) and choose as many of the books offered as you’d like to read. We have 32 books in the giveaway, so hop over there and pick out a few to read…or take all of them! Of course, I hope you will download and read my book, A Song for Marielle, which is the first book of my five-book series. The series is complete, so if you like it, you can find the other four on all the major stores. A struggling musician, Gillian hopes to parlay her talent into a successful career. But a blow to the head, throws a wrinkle in her plans. A request to play for a funeral leads to a starling discovery. She can talk to the dearly departed while singing. As she sings, she is spiritually transported to an ethereal graveyard where she finds a confused spirit who needs guidance. She can speak with the man and can even guide him to the next level. Okay, no problem. But this odd ability can also lead her to more trouble than she could have imagined as one of her spirit clients demands her assistance in locating the person who killed her. Gillian draws the interest of a sheriff’s detective, who thinks she may be connected to the case. If that’s not enough, she also draws the murderer’s interest. Will she be able to fulfill her promise to the spirit and save her own life? Warning, this book does contain some sexual abuse, so take that into consideration. Click on the image above for my universal link to the second book, “A Song for Menafee” at Draft2Digital. For the entire month, I am lowering my price for the digital books in the series by $1.00, so it’s a great time to buy them. They are all available on Amazon as well as Nook, Apple, Kobo and other formats. The first book will not be free on Amazon, so use the link for the giveaway to download it. I am also revealing the cover of my new book that will be coming out in early May, Time Walker. Isn’t that cover gorgeous? The incredibly-talented Barb Hoeter at Coverinked.com created it. I absolutely love it. My novel is a time travel fantasy with a touch of steampunk. More on that when I’m ready to release it. Hope it’s looking sunny where you are. Be sure to check out the Urban Fantasy Series Starters giveaway. Happy cold February. It seems like just about everywhere is getting hit with winter storms. Even Las Vegas is shimmering under a pretty decent dusting of snow. When I lived there, I think I only experienced one dusting of it. Reno, on the other hand, has been getting pretty good snowfall this month. We’ve had nine storms come in although the first two were heavy rain in the city while the mountains took the brunt of it. The Sierras are entirely coated with the white stuff and look gorgeous. But I digress… I am actually wanting to remind you that the Light Up the Galaxy free science fiction and fantasy giveaway only has five days left for you to go check out the books offered and grab yourself a free copy of a few of them. 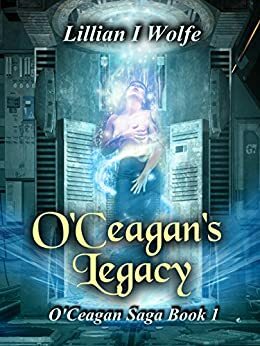 My book, O’Ceagan’s Legacy, the full novel, is available for free. One of the hardest things for a writer to do is get noticed amid the tremendous number of authors publishing now. So, this giveaway is a way to combine the power of all the participating authors to try to reach more readers, so we invite all of our readers to explore the books offered. No obligations, but if you do read and enjoy the books, a review would be greatly appreciated. It really does help others to connect with the books. So, please, before this promotion ends on February 26th, go out and download a few books that sound interesting to you.